Sick boys and 20 inches of snow were not kind to my running this month. I fought through it all, but did have to do a rather gnarly 14 mile treadmill run one day. Not my idea of fun, but easier, perhaps, than trying to run 14 miles in twenty inches of snow. The following week, I chose to brave the conditions and do a 16 miler outside in pouring rain and wind gusts. It was a long, slow run. Also not my idea of fun. But I was glad to be able to run it. Needless to say, my treadmill broke the 1,000 mile mark this month. I was happy to have the treadmill option, even if I am tired of running indoors. Paul was kind enough to get me an Ipod Nano for Valentines, and it helped to have some new music along the way. I also had quite a few "unscheduled" snow shoveling workouts which lasted a couple of hours in duration. Fun, fun, fun. I bet you are loving having a Nano to run with. And here we are again with school closed for the day. I hope you have lots of activities planned for the boys. One day they will all be old enough to have a chess tournament. That's quite amazing! I have managed to do my little 3 mile run up and down the farm lane each morning despite the cold and I really feel good afterwards! Congrats on your numbers for February! You are a motivated person! We added a Bowflex weight/resistance machine this past weekend to the collection, and are hoping it will improve overall fitness levels beyond just the biking. Looked like more white stuff coming your way. We rode around and looked for fun yesterday, but it was hard to get out for a mile. I am determined to do the stairmaster today! Well done on the running, and the show shovelling. Snow shovelling is good exercise; we know that up here. Running in the rain is not fun. Running in a snow storm, however, is fun! Well, maybe not at Roanoke. Just noticed Francie hasn't made your "Meet the Animals" page. How is she doing? I'm so impressed with your perseverance! Good job. We're getting more of the white stuff as I write this--snow and sleet. Temps falling. It will be a mess out there soon. That's a lot of miles! I have a treadmill collecting dust in our basement. Hurray for March - NOW, Get us some Spring and we'll be mobile again. 16 miles?! Nice work! I started running this year & am tuckered out (and bored) after running 3 miles. Hope everyone is feeling better soon...and you can run outside again. I love the collective readout like that on the display!! Mine does the run only (but it's not a Nordic). Last month was a short month, and you got a lot accomplished I think!! :) High five to you. Lisa, your stick-to-it attitude and accomplishments amaze me, you go girl. 16 miles in the rain, holy cow. A good day for me is a four mile walk. On a clear sunny day! You really are a trooper! Hopefully the snow will let up soon and spring will actually come. We hope everyone gets better soon. You are an amazing momma! That's a lot of treadmill running! Glad you had some music. I am totally impressed with your running! I had to do a double take on that 30k (plus) calorie burn! Woohoo! I sense a bit of sarcasm in the 'fun fun fun'....Ha! Hopefully you'll have better conditions in March. 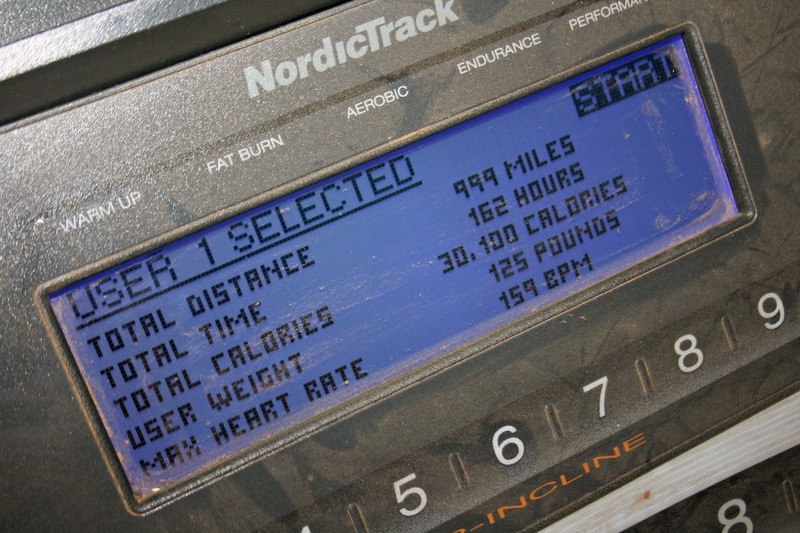 Congrats on achieving 136 miles and breaking the 1,000 mark on your treadmill. You're pretty amazing to accomplish all these miles during one of our most difficult winters ever!